In our last three-part segment of this series, we discussed clothing and personal paraphernalia depicted in paintings of the Mughal rulers. We looked in detail at the illustrations done by French artist Racinet, who produced a formal study of Mughal costumes and interiors, and described the overlapping of Persian and Indian styles and the appropriation of Vaisnava themes evident in some of the images. Next we'll consider not the appearance, but the actions and policies of these Mughal Emperors, who had an enormous impact on Vedic culture. Much has been said about the history of the Mughal invasion and the destruction of thousands of Hindu temples by their hand. Among the six primary emperors, Akbar is generally thought to have been the most benign, and Aurangzeb to have been the most cruel and demoniac. But in fact, all were responsible for the destruction of India's temples, to varying degrees, beginning with Babur's destruction of Lord Rama's temple at Ayodhya, upon the ruins of which the Muslims built the Babri Mosque. In an earlier segment we looked at a timeline of events that marks two important instances of Vaisnava temples being destroyed several hundred years before the Mughal invasion officially began. These include the desolation wrought in Mathura by Mahmud of Ghazni in 1017 A.D., and the destruction of the temple at Somanath a few years later, when the same intruder ruined the Sivalinga and killed some 50,000 defenders. Mosques were built on both these sites. With the arrival of Mughal emperor Babur in 1526 A.D., there was the destruction of Lord Rama's temple at Ayodhya. In 1688 A.D., Aurangzeb demolished all the temples in Mathura, said to number 1,000 – and these were just a few of what many believe to have been the approximately 60,000 Hindu temples destroyed during the Mughal era. While the actions of the Mughal rulers seems like ancient history, in fact the repercussions are strongly felt today. The details of temple destruction history are an ongoing lightening rod for political and religious disagreement. Hindus rally to the history, sometimes using it as rationale for ongoing anti-Muslim sentiment. Muslims claim that the damage to Hindu temples is vastly overstated, for just that purpose, and they fiercely defend their rights to the Muslim monuments built on what were previously temple sites. The perfect example of this dynamic is found in the case of the destruction of Lord Rama's temple at Ayodhya. Built around the 12th century, it was destroyed by the order of Emperor Babur, whose general, Mir Baqi, constructed the Babri Mosque in its place. 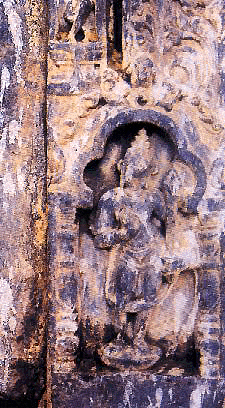 In 1949 – some 420 years later – a major dispute erupted when Rama icons appeared in the mosque. Lawsuits were filed by both Hindu and Muslim parties, and the government locked the gates to the mosque, declaring the site "disputed". In 1984, Vishwa Hindu Parishad (VHP) and Bharatiya Janata Party began a movement for the re-creation of the Ram Janmabhoomi Temple. Two years later, a judge in Uttar Pradesh ordered that the mosque be opened to Hindus. This was seen as a counterbalance to the favor shown to Muslims in another situation, Shah Bano. During 1989-1990, the VHP laid foundations for the new Ram temple on adjacent property, and the crisis between Hindus and Muslims escalated. 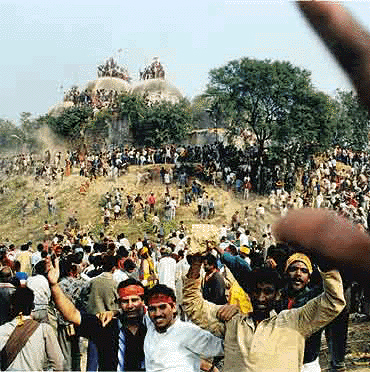 In 1992, the Babri Mosque was forcibly demolished by Kar Sevaks. A great deal of rioting followed, and a makeshift mosque appeared in its place. 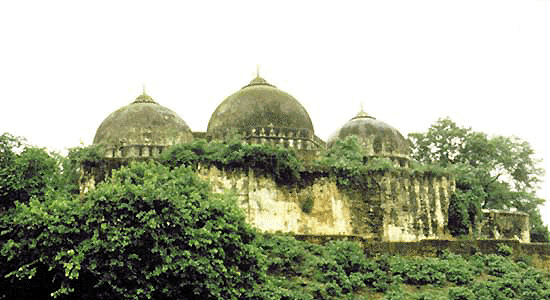 In 2005 Islamic terrorists attacked the Ram Mandir structure and were killed by security forces. This further escalated the fighting, which goes on to this day. Having made numerous studies, the Archeological Survey of India (ASI) found that a Hindu temple did exist in ruins beneath the mosque, so an official position has now been taken on that point, although many Muslims continue to deny it. In fact, there is now archeological evidence that two Rama temples stood at the Ayodha site, and history suggests that both were destroyed by Muslims. The first may have existed in the 12th century and been destroyed by Muslim invaders following Muhammad of Ghor's defeat of Prithviraj Chauhan in the second battle of Tarain, 1192 A.D. This temple appears to have been rebuilt, then destroyed a second time by Babur in the 16th century. 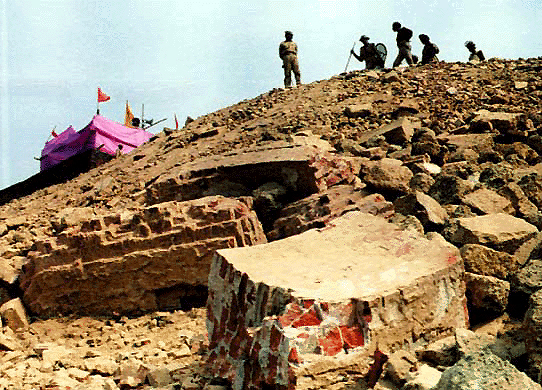 When the Kar Sevaks destroyed the Babri Mosque in 1992, in the ruins they unearthed numerous relics that appear to prove definitively that the Ram temple did exist in ruins under the mosque. Although Muslim supporters accused the Kar Sevaks of planting evidence, they have not been able to argue down the discovery in the mosque ruins of a stone plaque with an inscription documenting a 12th century Hari-Visnu temple at the site. 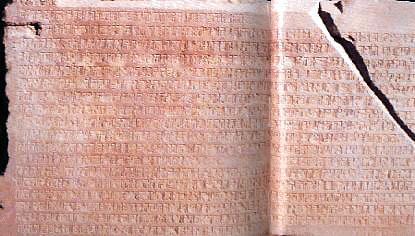 The Sanskrit inscription, engraved in classical Nagari script of the 11th-12th century A.D., was evidently mounted on the wall of the temple. It clearly describes the temple construction, and the beautiful temple of Vishnu-Hari, built with heaps of stones and beautified with a golden spire, unparalleled by any other temple built by earlier kings. This wonderful temple was built in the city of Ayodhya at Saketamandala. The plaque also describes Vishnu destroying King Bali, and the ten headed personage (Ravana). The discovery of this plaque is a major setback for the naysayers who assert that the Mughals didn't destroy Lord Rama's temple at Ayodhya. Of course, the battle rages on, and Hindu sentiments continue to run high against modern-day Muslims. So we can see that history has a way of coming around, again and again, and in the case of temple destructions, memories are not forgotten and the sentiments of the devotees are not easily set aside. In tomorrow's segment, we'll begin to explore some of the historical evidence of temple destruction by the various Mughal Emperors. We'll also consider some of the academic arguments asserting that history has been skewed, and that some of the Mughals actually took steps to protect the Vaisnava brahmanas and the temples.